CHICAGO – Too many critics have casually dismissed Richard Ayoade’s directorial debut, “Submarine,” as a mere Wes Anderson imitation. Yes, the picture is chockfull of arty hipster posturing: chapter breaks, deadpan cutaway gags and hapless adults viewed by a sullen 15-year-old protagonist forever cloaked in a large black toggle coat. He’s like Bud Cort fused with the hyper-articulate eccentricity of Max Fischer. Okay, so perhaps “Submarine” is a touch too precious for its own good. Yet for all of its self-conscious pretensions, there’s a tangible and poignant depth to this color-coded coming-of-age tale. Like Max Winkler’s marvelous Anderson-inspired comedy, “Ceremony,” Ayoade’s film employs familiar motifs to construct an overarching vision that is entirely its own. The picture’s cool surface is reflective of the characters themselves, who are adept at keeping their emotions comfortably submerged. Craig Roberts has the sort of blank yet oddly expressive stare that Kuleshov would’ve loved. He plays Oliver Tate, a razor-sharp boy teetering on the precipice of manhood. He wishes a film crew were present to follow his every pre-planned move as he attempts to navigate the troubled waters of adolescence. Unlike the outcasts featured a host of Sundance darlings, Oliver is not lovable in cuddly sort of way. Ayoade’s script stays true to the spirit of Joe Dunthorne’s novel by refusing to gloss over Oliver’s natural urges and character flaws. Like most kids his age, he’s entirely self-absorbed and not above “bullying the weak” in order to win the admiration of others, namely his secret crush, Jordana (Yasmin Paige). It’s refreshing to see a high school-set romance where the characters actually look like real teenagers rather than models ripped off an Abercrombie & Fitch ad. Jordana is probable girlfriend material for Oliver because of her eczema and relative unpopularity, but it’s her sly confidence and earthy beauty that make her so fetching. While Oliver looks perpetually bewildered, Jordana appears to be on the brink of breaking out into a guffaw, and both actors are able to convey a great deal about their relationship in scenes where they hardly say anything at all. 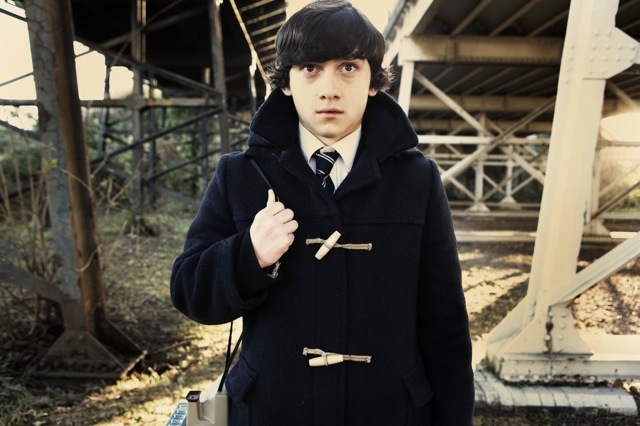 Craig Roberts as Oliver Tate in Richard Ayoade’s Submarine. The lack of emotional baggage in his courting of Jordana is a relief, since Oliver’s life at home has become increasingly tense. His mother Jill (Sally Hawkins) is a frayed bundle of nerves who’s slowly being driven mad by her oft-depressed husband (a beautifully restrained Noah Taylor, whose unkempt appearance is unaltered from “Red White & Blue,” in which he played a homicidal sociopath). Jill’s restlessness causes her to spend an unsettling amount of time with her old flame, Graham (Paddy Considine). He’s the type of pompous motivational speaker that Holden Caulfield would instantly deem a phony. Karen Lindsay-Stewart’s casting across the board is aces, though special attention must be given to Hawkins, who has proven time and again to be an actress of great range. From her enchanting comic turn in “Happy-Go-Lucky” to her coldly cruel cameo in “Jane Eyre,” it’s clear that Hawkins can play just about anyone. As the desperate housewife in “Submarine,” Hawkins gets to further display her comedic chops in a role that’s considerably more subdued than her previous work. She can garner big laughs simply by uttering a dispassionate “thanks” upon receiving an unromantic Christmas gift, or by forcing a cheery grin while celebrating her own birthday at work. 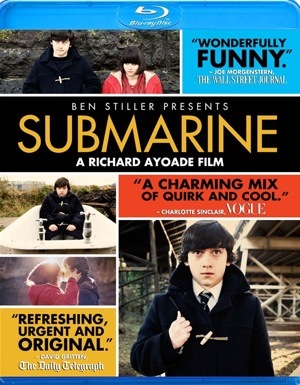 Submarine was released on Blu-Ray and DVD on Oct. 4, 2011. “Submarine” is presented in 1080p High Definition (with a 1.85:1 aspect ratio), and includes a brief making-of featurette in which Ayoade reveals his obvious love of J.D. Salinger and the hugely influential dark comedies of Hal Ashby. His background in helming music videos for the indie rock band Arctic Monkeys led him to utilize five songs by the band’s lead vocalist, Alex Turner. An Arri 2C camera was recruited to shoot the romantic montage in which Oliver and Jordana frolic on the beach. Natural light was used to great effect in these scenes, allowing Roberts and Paige to freely improvise on the last day of production. Taylor praises Ayoade and his crew for their ability to evoke a period flavor in art direction and film stocks without specifying a particular era. What’s lacking here is any word from executive producer Ben Stiller, who portrayed a similarly unsympathetic yet unusually engaging misfit in the equally overlooked indie “Greenberg” (his blink-and-you’ll-miss-it appearance in “Submarine” as an American soap opera star is little more than a distraction). The disc’s thirteen minutes of deleted scenes are primarily devoted to Considine’s laughably asinine monologues, which are essentially incoherent ramblings delivered with conviction. He’s an oddball delight and so is the film. ‘Submarine’ is released by Anchor Bay Entertainment and stars Craig Roberts, Yasmin Paige, Sally Hawkins, Noah Taylor and Paddy Considine. It was written and directed by Richard Ayoade. It was released on Oct. 4, 2011. It is rated R.